This spectacular musical production captures the uniqueness, humor and talent of Frank Sinatra, Sammy Davis Jr., and Dean Martin. Frank, Sammy and Dean all received critical acclaim in their glory days of the fifties and early sixties. The Rat Pack was an unstoppable force to be reckoned with on the Las Vegas strip and this show captures and continues that magic. When the Rat Pack first made the scene, adult males followed their every move as they became role models for a generation. They showed that you could dress to the nines and still not come off as a "stuffed shirt." The Rat Pack represented the Las Vegas attitude and lifestyle. They personified everything that Las Vegas stood for. They projected an aura of sophistication and style that was unparalleled during their time. During their heyday, each member of the Rat Pack was a formidable showman in his own right. Yet while on stage, together they possessed an amazing chemistry as they cracked jokes and made fun of each other. The Rat Pack did not just put on a musical show: they helped to define a generation with their music and style. 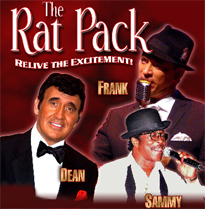 The Rat Pack Live from Las Vegas in Branson features a talented cast, an on-stage backing band, and glittering cabaret set 15-piece orchestra. Enjoy the classic recordings of Frank, Sammy and Dean in this sensationally staged production that brings the music and lives of these legendary characters together again. 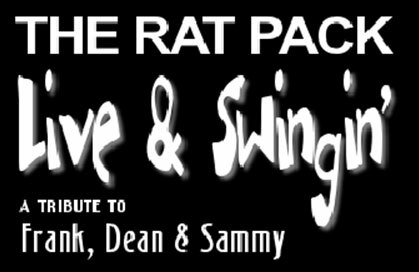 This one-of-a-kind production features a selection of the Rat Pack's greatest hits, including "Lady is a Tramp", "Come Fly with Me", "Volare" and "What Kind of Fool am I." The performers give the audience a medley of song and spoof, conducted in an atmosphere of jousting that probably comes close to the original for its authenticity. The Moonlight Serenade Orchestra not only assists in showcasing the greatness of the Rat Pack, but also performs a special segment tribute to Glenn Miller. This performance is perfect for anyone who was a fan of the originals as well as a great way to introduce someone new to Las Vegas's greatest showmen. For those of you that have had the chance to experience the originals, this production should bring back many happy memories of an era gone by. For those of you that have never had the opportunity, this show will give you an idea of what you have missed. The heyday of the Rat Pack was an era of awesome talent that will never come around again. Good show. Sinatra was weak, the other two performers were quite good. Dean Martin was amazing and so was Sammy Davis Jr.! !